Here's my latest new free pattern. 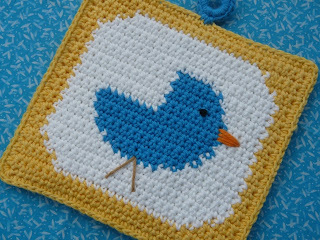 Stitch a pretty bluebird potholder for your kitchen. This potholder is stitched in single crochet and includes both a color chart and row count instructions. If you need any help on changing colors, please see my changing colors tutorial listed on the left sidebar. Hope you enjoy! Click on the download link below picture to get pattern. Thanks for the pattern Doni -- she's too cute! I made several of these and just love them. Thank you for the pattern Doni..I know I will be using it again and again. You have some adorable patterns on here. Thank you for sharing your talent with us! You are good, this is adorable I can't wait to make it, Thank you!